In the variety of articles, diplomatic negotiations, resolutions and fears about chemical weapons in the Middle East, with which the Assad regime “threatens” one and all, the issue of chemical weapons in Israel has remained in the shadows. This topic was the subject of an examination by the influential Israeli newspaper Haaretz. The start of the process to eradicate chemical weapons in Syria opens the door to a review of the Israeli government’s own position regarding the Chemical Weapons Convention. Israel signed this convention back in 1993.However, since then it has refused to ratify and comply with the rules dictating the transfer of information, international control and destruction of substances intended for the production of chemical weapons.Jerusalem’s official position states that as long as there are hostile states possessing such weapons, Israel will not ratify the convention. According to”Haaretz”, this is a rather short-sighted approach, with questionable benefit. In this type of “containment strategy”,Israel receives no benefit from the concealment of information relating to the possession of chemical weapons. It is hard to envision a scenario in which the Tzahal (Israeli Defence Forces) would use sarin gas in order to contain an enemy ground invasion on its own territory or to strike the rear of the opposing party. After all, Israel has other means of intimidation that can be effective without the threat of chemical weapons. The stockpiles of nerve gas, which Syria was thought to have possessed, were always considered by Israel to be a threat to its home front. The Israeli authorities have invested huge sums in the purchase and maintenance of chemical protection for its civilian population. At the beginning of the “Arab Spring”, civil war broke out in neighbouring Syria, threatening the central government in Damascus.This intensified Israel’s fears that Assad could send chemical weapons to Hezbollah, or non-conventional weapons could fall into the hands of Islamic radicals fighting in Syria, fears which seem to have unexpectedly pleased Western countries. But now control over the Syrian chemical arsenal has been established and their removal from Syrian territory and elimination have begun (which must be fully completed by the middle of next year). It seems like this should have had a clear impact on the position of the Israeli ruling circles. But things are right back where they started. 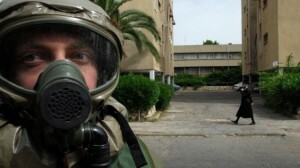 No one mentions the ratification of the international convention, whereas Syria’s elimination of chemical weapons removes the threat from Israel and visibly reduces the danger of these weapons spreading to the hands of Shiite group in Lebanon.It is impossible to destroy reservoirs of gas from the air, which is why a diplomatic agreement seems to be the most effective way to eliminate chemical weapons in the whole region. The major world powers, including the United States and Russia, have already implemented the provisions of the Chemical Weapons Convention and have abandoned their stockpiles of nerve gas. And Israel can do the same. In the course of the signing in 1993, then Israeli Foreign Minister Shimon Peres said that “there are no weapons to fight non-conventional weapons, there are only certain policies that can prevent their use and production.” This statement by Peres, who is now the president of Israel, rings true to this day. Ratifying the Convention will save Israel the considerable funds needed for the production and storage of chemical weapons. It will also be beneficial in strengthening the state’s reputation and prevent a situation in which Jerusalem is forced to do so under international pressure. After all, the agreement made by the United States and Russia concerning the elimination of the Syrian chemical weapons is significant for Israel as well. Alexander Efimov, Candidate of Historical Sciences and expert on the Middle East, exclusively for the online magazine “New Eastern Outlook”.